The Honeywell Dolphin 6110 is a classic all-round mobile computer. Compact, light and stylish, it’s 2.8″ touch display easily meets the numerous requirements of the mobile worker, such as in inventory, logistics or in light industry. Even when working in the field you have complete access to real-time data at all times with the Dolphin 6110. The mobile computer comes standard with 802.11 a/b/g/n Wi-Fi, plus Bluetooth. You even hold conversations via voice-over IP, so that the Dolphin, in some applications, even replaces the obligatory cell phone or smartphone. Choose between an integrated laser scanner or imager for 2D barcodes. 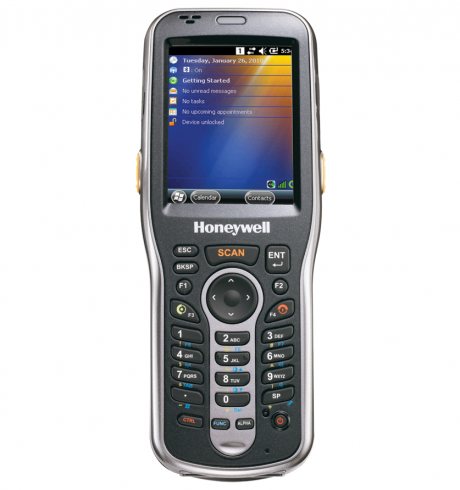 The scanning unit is angled so that users may see the display while scanning – an ideal feature when capturing barcodes, images and signatures. Despite its small size the plastic housing is robust and is capable of withstanding every day damage. Even accidental drops from heights up to 1.2 m are no problem. For additional protection, the Dolphin 6110 is IP54-certified against water and dust.